LDS also known as the Church of Jesus Christ of Latter-Day Saints, has furtive intentions to have a church Monarchy dominate Democratic America and the world. LDS conspiracy, present day and historically, to control America and the world. 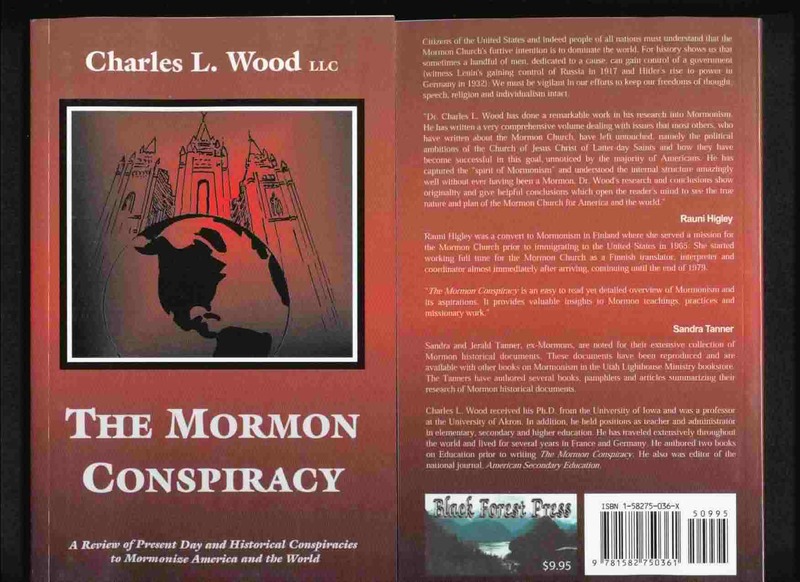 The scholarly book The Mormon Conspiracy reveals to the reader the political ambitions of the LDS and how it conspires to control America with its growing membership. From the days of Joseph Smith to the present time, the LDS church has developed an extensive social and peer group organizational conspiracy to keep members in the church. The active LDS member spends about many hours a week in related activities that include church attendance, volunteering, and social activities. Everyone in the family is immersed in LDS sponsored activities, which include volunteer service as home teachers (men), visiting teachers (women), as members of a LDS basketball league, attending Boy Scout meetings, acting as Boy Scout leaders and for adults serving on the various auxiliaries. Other jobs in the LDS church include bishops and their councilors, stake presidents and their councilors, Elders’ Quorum presidents and their councilors, teachers in Relief Society, Mutual Youth Organization, Primary (for Children under 12) etc. All of these LDS church programs are directed by local volunteers, who receive their direction from Salt Lake City. The men have priesthood meetings on Sundays, while the women have Relief Society meetings. During the Sacrament meetings, (communion) bread and water is passed and assigned “talks” are given by members of the ward. They also have singing, and necessary announcements are made about upcoming events, etc. The first Sunday of each month is called the Fast and Testimony meeting, where there are no assigned talks, but members are encouraged to “bear their testimonies,” saying “they know that the LDS church is the true church and that Joseph Smith was a prophet, and that the current president is likewise a prophet of God and that the Book of Mormon is true,” or something similar to that. “Ward, Stake, and regional levels encourage a wide variety of social opportunities for members of all ages, including theatrical projects, youth orchestras, athletic competitions, choirs, mini-trek camp-outs, square dances, and devotional or ‘ Fireside meetings,’ where talks are often given by visiting scholars or General Authorities. Learn more about The Mormon Conspiracy at the following website links.